Just a quick update from the field. I have revisited the two nests that belong to our polygynous male. I held my breath as I drove up and got positioned between the two nests so I could view both. I set the scope on one nest and waited patiently. Female was up but chicks were all snoozing. I waited patiently. Two heads up....what happened to number three? Did we lose one? Wouldn't be surprising in this kind of a situation. Then I focused on the other nest...quickly counted the chicks. 1,2, 3! Then all voices rose in a cacophony of food begging...here comes the male. Where will he go? Straight to his primary nest with a goldfish. Off he went as the other nest continued the insistent food begging. The female on the primary nest began feeding the three cutie patooties (a scientific term). In less than ten minutes he arrived at the secondary nest with another fish, and THREE chicks stood up! Yeah! All six chicks have survived this far and our busy male is keeping up with the demands of having two families! What do ya say about that? Wow! So many interesting behaviors are being observed on the nests. Some surprise me or cause me to return over and over to try to gather a few more pieces of the puzzle. Yes, sometimes it's not clear to me what is going on! Some time ago I reported about a female whose mate from last year had not returned. Instead she mated with another male who I have watched on another nest for years, but he was somehow displaced from his nest. This new pair laid eggs and I observed that male incubating and bringing fish. All seemed to be going well with her new mate. However, there were repeated intrusions from another male. I realized that I had not seen the first male for some time and decided to sit and watch for a longer period to try to figure out what was happening. That is when I observed the female leaving to feed herself. She would food beg loudly for long periods but no one brought her any fish. While she was gone one day the new intruding male was on the nest "digging" and it appeared as if he had destroyed the eggs. The female returned and did not resume incubating right away....she sat on the nest perch and walked around the nest edge looking down. I assumed the nest had failed. On my next visit I saw no Ospreys. Another visit found that second male (the intruding male) working on the nest, bringing sticks. I have never seen the male who was on the nest at the start of the season. The female accepted this new males presence. The next visit I found the female incubating again! This newer male was there often but he would not incubate or provide food. At first I wondered if they had laid more eggs, tho I had never seen them copulate. So I just kept returning to this nest every few days and then I was surprised to see signs of hatching! I was quite shocked. Happy that an egg had survived whatever has happened there, but also saddened that the new male was not incubating or providing any food for the female. As time has gone on, I have determined that there is only one chick on this nest. The new male has started bringing fish and dropping it for the female, but he does not bring enough fish, nor does he share in any of the parenting duties...but why would he? This is clearly not his offspring. The female seems stressed and thin. But the chick is surviving! It's interesting to observe these behaviors. Why would this male expend any energy providing for a chick that is not his? What is really happening here is that this male is trying to acquire a territory. He will not care for this chick but his provisioning is an attempt to win the female and take over this territory. He is defending the nest as his own, working on the nest, in spite of that chick there! I worry about the female, and have my fingers crossed for this nestling. This new male is helping the female by chasing away other males, and he does bring some fish. With as large a population of Ospreys as we have here now, there is a lot of competition among young males for good nesting sites. This is one strategy for winning a territory. I have seen this before and that male did win the territory for many years of happy nesting after rescuing a damsel in distress, and just tolerating the offspring of another male. He is investing in the future. I hope it works out this time. I keep watching to see how the behaviors are changing, hoping for a happy ending for all...except perhaps for the original male who disappeared. On a happier note, I stopped to check another nest today and found a delightfully devoted male osprey feeding his whole family...a bite for each of three chicks and then a bite for Mom. He rotated around all the mouths on the nest and sometimes the female passed her bite onto one of the chicks. So endearing to watch. A family affair, all working together to care for each other. The chicks lined up and patiently waited for their bite. Awwwwww. Sometimes that is all you can say eh? Does the heart good! The single egg on the Arboretum nest hatched yesterday , June 19, at about 6 a.m. Both parents were so excited, as new first time parents often are. The male was so very interested in peeking at the chick. For some reason I can't get photos to load here but there are images on our Facebook page if you want to see the little one half way out of the egg, and subsequent photos of the parents watching the little guy. All is well this morning on the Arboretum cam nest. Chick survived the heat and the storms yesterday. Female is keeping the chick hidden this morning, but I did see the little wiggle worm beneath her. Mr Z3 is so fun to watch....he arrived with a whole fish a short time ago. Many of you know that males usually eat the head of the fish off first, with all its boney parts and then presents the soft body of the fish to the female so she can feed the soft fleshy parts to the young. The female did not get up when he arrived with the whole fish so he left with it, ate the head off and returned and offered it to her again....he literally dropped it in front of her, but again, she did not get up, so he ate the whole fish right there in front of her. Then she stood up and I saw another whole fish laying right next to her!!! Ha ha he is providing well for them! He was out on the nest perch, but when she stood up he flew into the nest right away and cocked his head to the side to peek at the wee one. He is so curious, wants to see the chick, and is doing a great job of providing. It makes me smile to watch him. They are off to a good start! Well, well, well. It's now been nearly a week since I visited the location of the polygynous male and his two families. ( it took me a while to get the last post written). The update today is interesting. I can now count the chicks on both nests and they each have THREE chicks!!!!!! I am sitting here now observing the male on the primary nest, as he is watching the female feed a goldfish to the three chicks. This is where he prefers to hang out. I have watched him try very hard to steal the large fish away from the female three times. She would not let go. I wonder if he wanted to take it to the other nest or eat it himself. His crop is empty. This guy certainly has his work cut out for him! But he has done this successfully before, so if anyone can do it, he can. I know that someone has coined the phrase "Super Osprey", and if anyone deserves that title, it is his guy! Now the male has departed the primary nest and the female on the secondary nest is food begging loudly. Her crop is empty. The temperature is expected to hit the mid nineties today with extreme, oppressive humidity. I hope these birds all are able to stay hydrated. It is 9:30 in the morning and it is miserable out here. Storms are expected tonight. Keep your fingers crossed for these two families. Its hard to tear myself away....interesting behaviors captivate me, even after all these years. I am so curious about what will happen next...and I want to see it all! Now the secondary female is quiet, so the male must be out of sight. Will he return with a fish for this female and her chicks? Nope. He just returned to the primary nest with a stick. Off he goes again. I am parked between the two nests with my scope mounted on the window so I can see and hear what goes on at both nests. The sun is sizzling hot. I am longing for an iced coffee, but can't leave or I might miss something!!!!! He's back again on the primary nest with more nest material. This nest definitely gets more attention and care. He has just returned with the third stick...he seems to be chick proofing the nest, building up the sides. Now he is perched outside the primary nest, but very near this family. I am watching the other family....the littlest chick there is still light colored and completely downy...about a week of age, while the older two are larger and darker as they lose their down and begin growing feathers. These chicks are now pecking at each other, which is a common behavior that is usually observed at about two weeks of age. They are literally establishing the pecking order. Parents don't intervene. I have seen this so often and it usually does not result in injury or death, but in an unusual situation such as this, where survival may be at stake, it could potentially be more serious. Lack of sufficient food and fluid is a definite concern here, especially as I watch the male perching near the other nest, ignoring this females calls for food. I can see no crusty salt residue on her nares tho so I know she has eaten today, is hydrated and there is no crisis. The chicks are pooping...love those little squirts coming out of the nest, so we know they have eaten today. We watch for the subtle signs, keep our own emotions in check and document carefully. This is how we learn. I have been here for about three hours and have not seen the secondary nest be fed. The male has just shown up with a large goldfish and is on a power pole eating...near the primary nest. Well, not surprisingly, he took the rest of the fish to the primary nest. Frustrating to watch, for sure. The last time this male produced six chicks I predicted that they would not all survive, but they all made it to fledging age! The Ospreys love to prove me wrong! So I can only hope for a similarly amazing outcome here. Time will tell! This weather complicates things. The police just came to check out the reported "suspicious"activity. Ha ha. I can take no more of the heat.....I am soaked in sweat. Holding a good thought for these birds. Family on the primary nest have finished their lunch and male has departed at 1 p.m. 89 degrees. Unbearable humidity. I have been checking nests 3-4 days a week but can't seem to find the time or inspiration to write the stories! 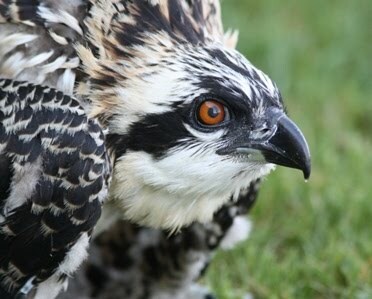 I do want to fill you in a bit tho....earlier this year I wrote about polygyny (one male, two females) among Ospreys. I shared my historic observations with Emyr Evans in Wales too since Monty, the male on the Dyfi nest, was engaging in this behavior. Most of you probably know that one of Monty's nests failed, as is usually the case. Now I can report that our male, who has done this for the third time this year, has successfully hatched chicks on both nests. His primary nest hatched ten days to two weeks ago and I have been starting to count heads there...at least two chicks. The secondary nest has just hatched in the past week, and the chick or chicks are too young to see yet, but we can tell by the adults behavior that they are feeding at least one chick. The secondary nest definitely gets less attention....the other nest is fed first and probably more often and he tends to hang out there more frequently. But clearly he is giving enough attention and providing enough food for at least one egg to have hatched. We did find him perched near the secondary nest this past weekend. We are expecting some hot weather in the next few days and this can be hard on the newly hatched chicks since they can't thermoregulate at first. The only fluid they get is from the fish, so regular feelings are extremely important to their survival. I hope he is able to provide enough fish for them all to remain hydrated. The secondary nest failed last year (eggs didn't hatch since the female had to leave them unattended to feed herself.) However, in 2013 he attended two nests that each fledged three chicks! He is quite an interesting male! In 2015 he established the secondary nest much closer to his primary nest than was the case in 2013. We will be watching closely to see if chicks fledge successfully from both nests. Polygyny is a breeding strategy this is not often successful among Ospreys, but it's so fascinating that this male has done it successfully and continues to engage in polygyny repeatedly.